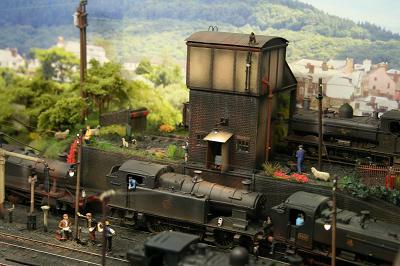 Size: Scenic area 48 inches long 16 inches wide, including hidden ﬁddle turntable. Locomotives: Steam, South Wales tank engines including, panniers, prairies, eight coupled tanks and tender engines, BR standard tanks plus early diesel classes 37, 14, 08s. 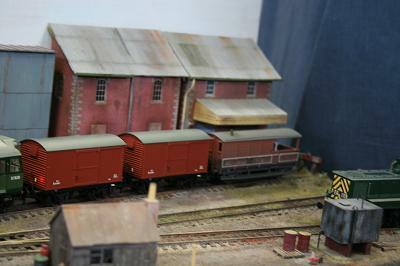 Rolling stock: Brake vans, tool vans. 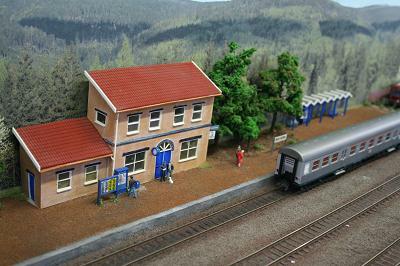 Power and control: Gaugemaster Prodigy Advance DCC and Sound Buildings: Engine shed and associated buildings scratch built and retail products. A lifelong love of Railways (British Railways) led me to recreate those trainspotting days of the late 60s and early 70s, inﬂuenced by mainly South Wales transition steam/diesel and later diesel (Western Region ﬁrst and then the other regions). When I was a lad of about 7 (1962) my Dad would take me to work with him delivering petrol to garages in the Welsh valleys, one delivery was to a garage above Abercynon, where from the forecourt you could look down onto Abercynon shed still in steam, a memory which has stuck ever since, also the shed lasted into the diesel era as a stabling point and then a crew signing on point, stabling class 375, although a Hymek did visit on one occasion I have been informed. I had to refer to many books as well particularly "THE SOUTH WALES VALLEYS" by Edward A Evans Pendragon press. 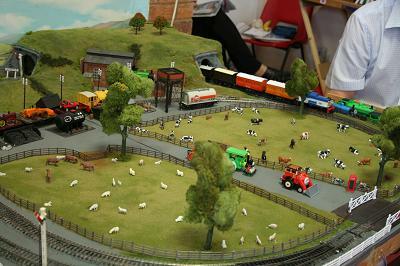 A ﬁctitious layout based on the concept that the M&SWI continued as a secondary route though the Cotswolds despite the Great Western Railways endeavours to rationalise it during previous years. 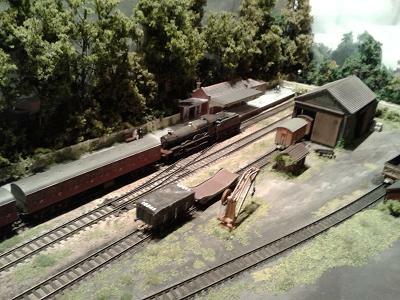 The era is set during the 1950's and allows through trains to be run from the Midlands (LMS), Southern as well as a variety of Western (GWR) and lately British Railways locomotives and rolling stock. Bad Horn represents a branch line terminus in the Teutoburg Forest, Central German Uplands, around the turn of the millennium. The station sees passenger trains from Paderborn formed of railcars or push-pull coaches as well as wagonload freight services. Though Germany's railways were uniﬁed a few years previously, the stock is predominantly of Bundesbahn (West German) origin, most still carrying their old liveries with just a change of logo signifying the new organisation. 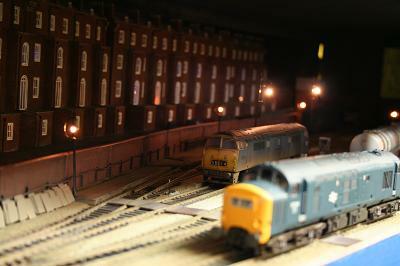 Trackwork is Piko, the working signals are Viessmann and train control is Roco DCC. Sometimes I operate the layout with former East German stock representing the Ore Mountains in Saxony, though strictly speaking the signals are incorrect for this area. A Slice of Southern Railway territory on the border of North Devon and Cornwall. Budemoor is a fictitious Junction off the Exeter, Oakhampton, Barnstaple and Plymouth lines to the town of Bude. Its harbour, a busy port for the export of stone, slate and minerals and the import of steam coal from Wales for the mines static steam engines and the railways. Due to the nature of the area and steep incline the branch into Bude had weight restrictions for locomotives and trains, goods trains requiring two manned brake vans for trains of more than 10 wagons. 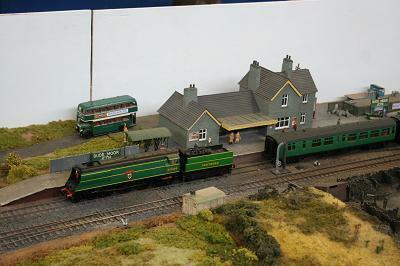 Locomotives and rolling stock are from all areas which formed the Southern Railway after grouping. Passenger traffic was at its heaviest during the summer thanks to the Victorians who developed seaside resorts such as Bude, Minehead, Ilfracombe and Padstow. Trains would leave London Victoria with 10 to 13 coaches and arrive in Padstow with just three, having dropped coaches off on route at the many junctions on the way. Elmfield is a small town in north Worcestershire on the edge of the Black Country, which kept itself very much to itself until coal was discovered in the early 19th century. It was then dragged, kicking and screaming, into the industrial revolution by the arrival first of the canal and then by the railway in the 1880’s by way of a branch from the Oxford, Worcester and Wolverhampton at Stourbridge Junction. The coal ran out in the 1920’s, but by then large deposits of fireclay had been found, and the production of firebricks and pipes had become the main industry. 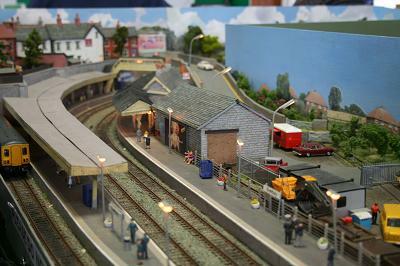 The model depicts the station and exchange sidings in the early 1960’s before the Beeching axe removed the passenger services in 1964. 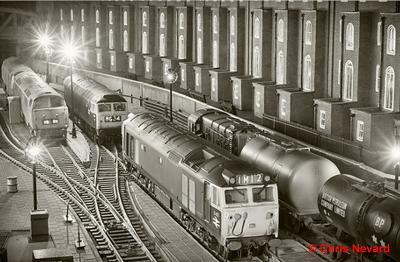 The use of firebricks and clay pipes was also in severe decline and goods traffic ceased completely on the closure of the works in 1967. 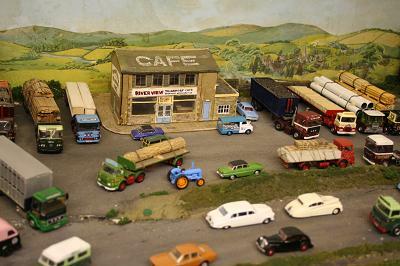 Everbury is a fictitious location near to Shepton Mallet on the Somerset and Dorset Railway section of the Western Region; it is assumed it was not closed in 1966 due to political and strategic reasons. The main line which has now been singled heads up over the Mendip hills to Bath crossing a viaduct and then through a tunnel. 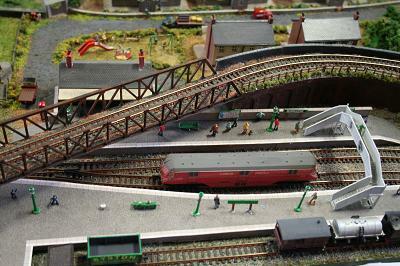 Also crossing on a parallel viaduct is a branch line down to Highbridge. In the opposite direction the line goes to Bournemouth. 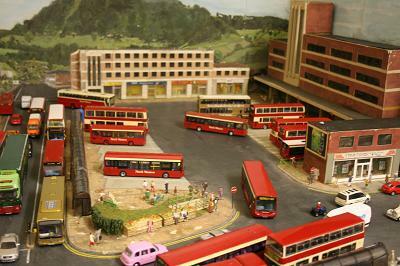 The model railway is operating in the period late 1970's early 1980's using rolling stock that was likely to be used at that time mainly from Bachmann, Hornby and Heljan and is DCC controlled with sound. Operation is approximately to the 1960's timetable with adjustments. 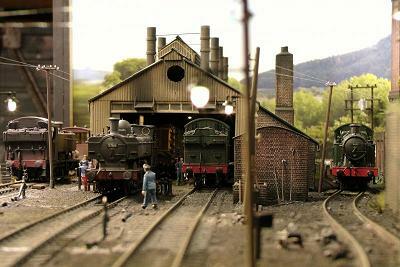 The buildings are in the case of railway infrastructure based on those on the Somerset & Dorset Railway and are scratch built. The platform canopies are of two different types, with the up side being of a similar design to Glastonbury, whilst the down side is similar to that at Templecombe which was built in 1938. The up side was not rebuilt due to the advent of the Second World War. 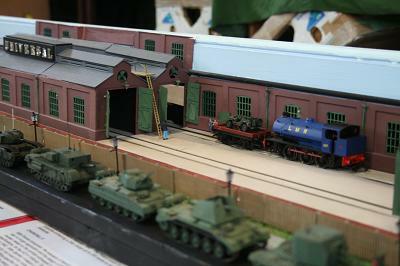 The other buildings are mainly Metcalfe kits with adjustments. 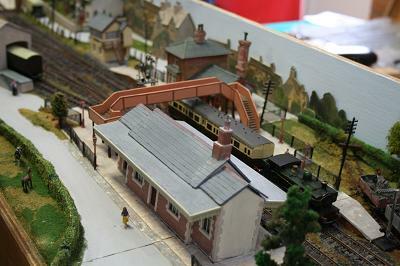 Neptune Road is a small inglenook shunting puzzle with DCC operation. 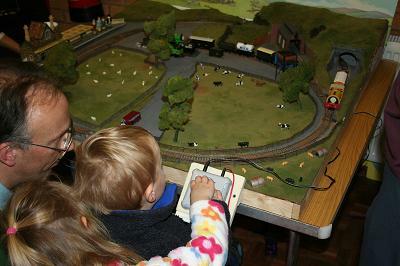 The layout is set in the BR 1960s period, which allows us to run a variety of steam and diesel locomotives at the same time. 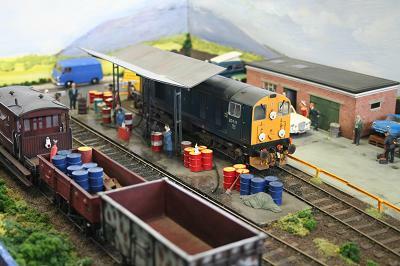 With some interesting shunting operations and DCC sound locomotives, we hope you enjoy the layout. Owzat! 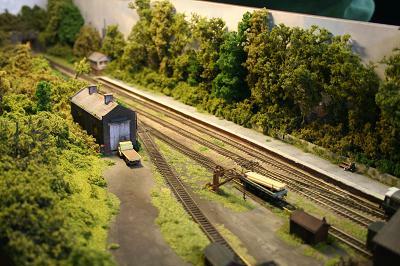 is a scenic N Gauge layout that shows how much can be seen in a small space. It features a village complete with playground, church and the local cricket team. 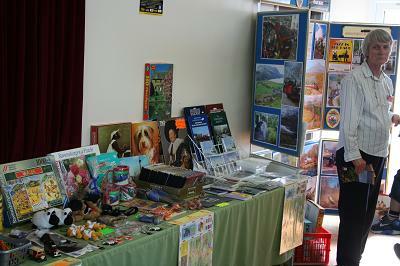 There is also a small station. The plan is a figure of eight single track with a passing loop. 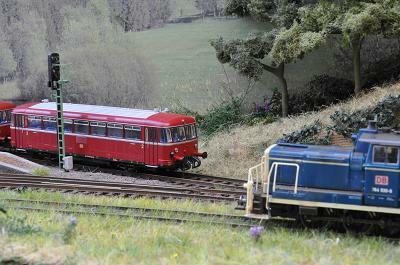 The stock that will be seen will be small trains, DMUs and the occasional visit from Thomas and Percy. Ranelagh Bridge is a representation of the Western Region stabling point situated on the approach to Paddington Station set firmly during the reign of the hydraulics. Corporate blue is the only colour seen, but sound is also evident on the diorama set at night, with the tenement blocks and yard dimly illuminated, the atmospheric layout takes you back to the mid 1970's. 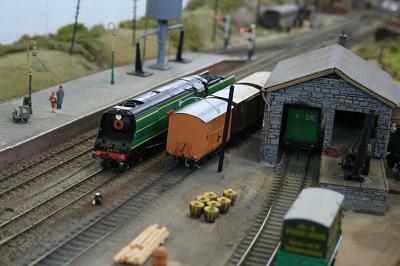 Operated by DCC, this is the latest model built by Cardiff modeller, Paul Rolley, and is scheduled to appear in a national magazine shortly. 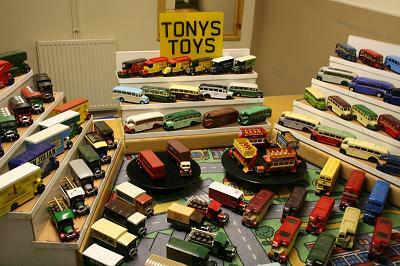 Studley Road has been around for 10 years now although not all of those were in my ownership. 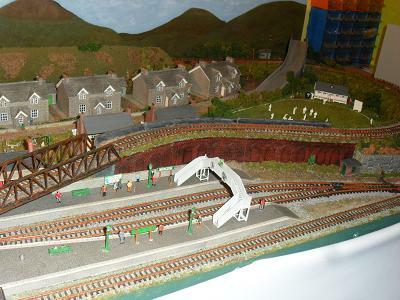 I originally owned the layout back in 2005 for a year before it was sold on. 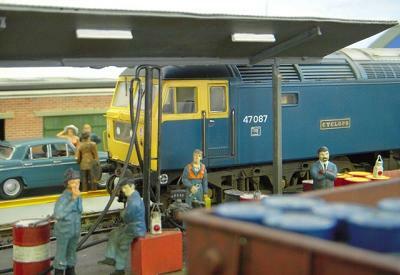 However, a chance re-encounter with the layout resulted in it coming back in to my ownership. It needed some restoration and at this point the decision was taken to add the LRT system on a track that was previously a derelict platform line. 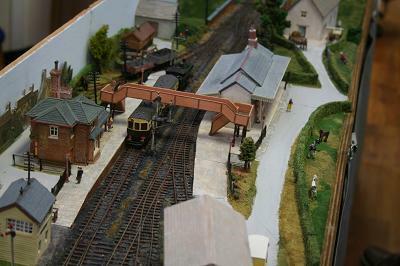 While undergoing restoration the chance was also taken to extend the platform, rebuild the bridge and also put a cover over the fiddle yard, which is now a set of industrial units and a car dealership. 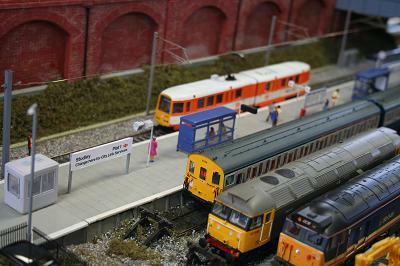 The layout is now based in the sectorization era somewhere in the north west of England and various different locomotives can be found stabled. 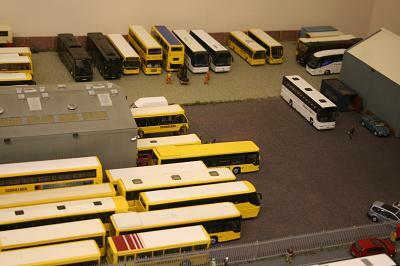 Together with the LRT and DMU shuttle service there's normally always something moving around.